Father’s Joy Charity Golf Classic! Click Here for full sponsor details. 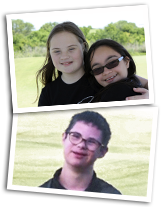 Our Green Masters are young self advocates who will be available during the tournament for photos, to share the amazing way they live life with a disability, and putt on two holes to give each team an opportunity to gain strokes on those holes. © 2012 Father's Joy, Missouri City, Texas. All right reserved. Photos used with permission. Father's Joy is a 501 (c)(3) organization.